Privacy is a major concern in today’s era because privacy breaches happen quite frequently. It is important to be vigilant especially when it comes to your internet browser. Google Chrome has built-in features to provide privacy to the users. You can enable or disable the features as per your requirement. However, you can different methods to improve the protection level of privacy. Related: How to protect Google Chrome when browsing? 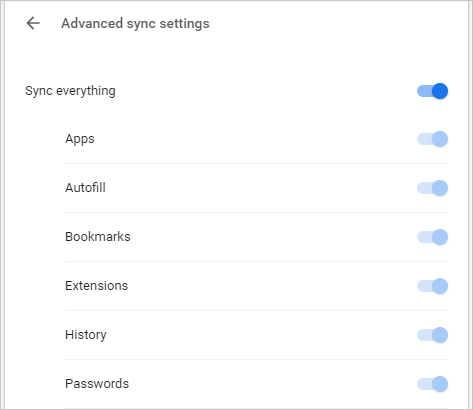 Google Chrome will automatically sync the data when you logged in to you Google account and enabled the sync feature. This syncing feature allows you to save and link important data like bookmarks, history, passwords and addresses to your Google account. You can access the synced data anywhere across the devices. However, a privacy breach of the linked email account can simply be disastrous. You have two options to improve the privacy: sign out your account or choose what you want to sync. Click on the three doted ‘Customize and control’ icon from the toolbar and click on “Settings” from the menu items. Click on “Turn off” button that appears under “People” section to disable the sync feature in Chrome. The other option is to choose what you want to sync. This feature will give you more control if you are aware of the extent of privacy you require. Click on the “Sync” settings which should show “On-sync everything”. Chrome will show you array of options. You can enable or disable each option depending upon your requirement. For example, disable “History” option if you don’t’ want to sync your browsing history. Cookies are piece of program code that website owners distribute when viewing the content. These cookies can help in retaining certain data like login credentials. Let’s say you are logged into Facebook. Launch a new window and open Facebook website. You will be automatically logged in as the cookies keep the login data at browser level. Other types of cookies are stored for certain time period like affiliate tracking cookies and most other cookies are retained unless you delete them from the browser manually. By default Google Chrome allows websites to save cookies for better user experience. Also websites from European union needs to show cookie consent information each time when a user visits a webpage on a site. This is a mandatory requisite of the newly introduced GDPR regulation. Though the purpose of cookies is to help users, cybercriminals target cookies, as it is an easy way to get your confidential information. 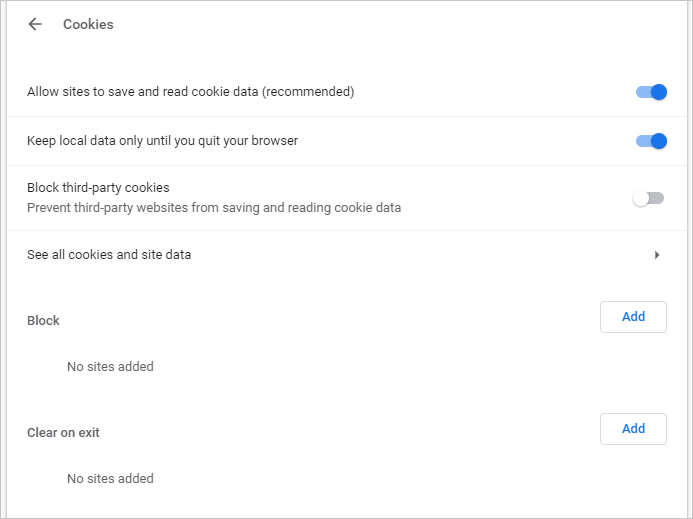 Fortunately, you can easily manage cookies in Google Chrome. You can either disable the cookies or allow websites to set them for only a certain session. Go to “chrome://settings” URL, scroll to the ‘Privacy and security’ section. Click on ‘Control settings’ option. 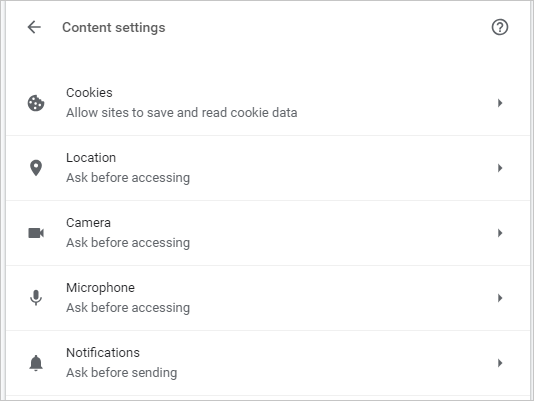 Now, click on “Cookies” under “Content settings”. Enable “Keep local data until you quit your browser”. You can also block certain websites or clear cookies on exit only for specific sites that you don’t want to save cookies on Chrome. An important part of privacy settings is not to allow anyone to know your location. Most modern websites and apps require your geographical location for different purposes. For example, Google Search will show you the local language search option or even directly open the local search page instead of English page. Services like Google Maps need the location for offering directions. Chrome asks the user before providing the information regarding the location. However, if you are looking for maximum privacy then you can simply disable it. Go to “chrome://settings” and scroll down to ‘Privacy and security’ section. Now, click on “Control settings”. 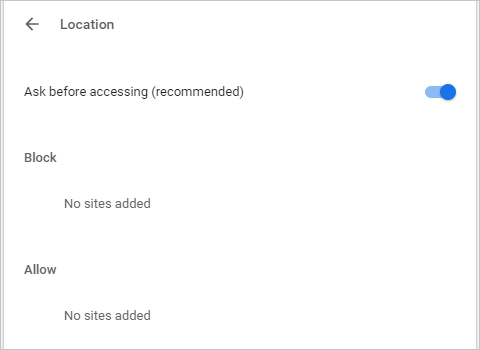 Disable “Ask before accessing” and it will disable any website to know your location. Remember, disabling location service will stop services like Google Maps. So ensure to disable only if you don’t want to use those services. 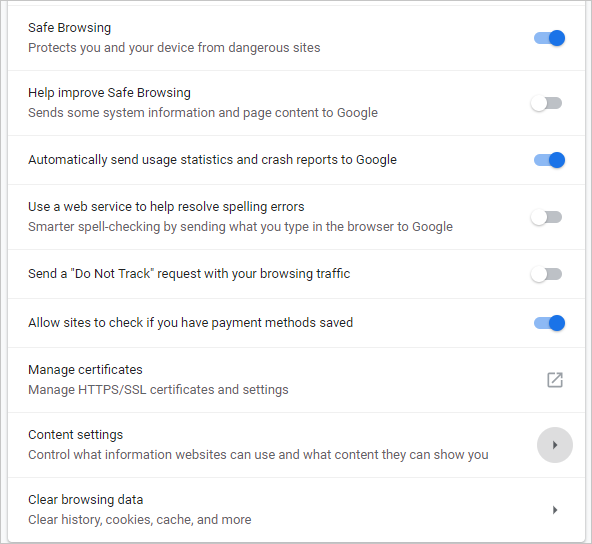 Google Chrome has numerous features in order to increase security. Also, there is a complete section under ‘Privacy and security’ under which you can optimize the privacy settings. Open “chrome://settings” URL in Chrome’s address bar and scroll down to “Privacy and security”. The user experience is largely affected by each of these services. Enabling or disabling any of the functionality is your choice. For example, enable safe browsing to stop malicious websites and protect your computer from malware. These websites are usually listed in Google’s database and are blocked when you try to access them. Apart from that, enabling “Do not track” option is also an efficient way to increase privacy. Enabling this setting will not allow websites to use and collect your data. Private browsing or incognito mode is a brilliant method to increase privacy. This mode allows you to browse internet without saving history, passwords and cookies on Chrome. When your browsing session comes to an end, Chrome will delete all your activities. 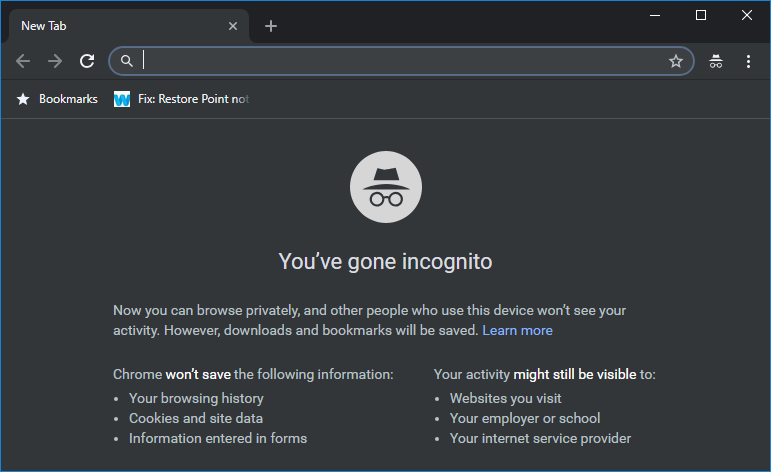 Enabling incognito mode is quite easy on Google Chrome. Click on “Customize and Control” icon and then choose “New Incognito window”. alternative you can use the keyboard shortcuts “Shift + Command + N” in MacBook and “Shift + Control + N” in Windows 10. The incognito Chrome window will open like below indicating Chrome will not store any historical information. Privacy is an important factor when using internet. Google’s major source of income is from online advertising and tracking the user behavior is important to customize the ad serving. If privacy is your major concern, avoid using products like Google Chrome. Mozilla Firefox is a good alternative browser for Chrome. However, Firefox also uses Google as a default search engine. So at the end, you will end up with the same results. The best thing what you can do is to use the above explained methods and improve the level of privacy when using Google Chrome browser. Note that disabling the privacy options may affect the user experience. That’s the trade off you need to pay in this world of information.